An award winning painter, Alita VanVliet's work has been described as strong, deep, and soulful, with a real personal energy. The artists current collection titled Nature and Spirit, clearly evokes a deep appreciation and connection to nature. Working in acrylics, using an expressive stylized approach her artwork is rich in color, texture, and luminosity. Originally from Northern California, she moved to the Southern California high desert town of Joshua Tree in late 2012 to pursue her art full time. Having sources for her subjects literally outside her back door, Alita works out of her studio overlooking the open desert, the national park and the village below. In the fall of 2017, her long time love for northern New Mexico spurred her to expand her work space to include Santa Fe. Her love of Santa Fe's surrounding natural environment, it's recognition as a world re-knowned art community and its unique culture and architecture provides her with fresh and exciting new ventures in art. Her desert landscapes, florals and architectural scenes have been exhibited in galleries throughout the southwest and sold to both national and international collectors. VanVliet's interest and studies in art began at a very early age growing up in a family supportive of the arts. Raised in the Northern California town of Palo Alto, CA. a city that is now known as the heart of silicon valley, her father was an architect, potter and instructor and the tools to create were all around her. Her structured studies include many forms of art from painting, jewelry and illustration to fashion and landscape design. She holds two formal design degrees and worked as a professional landscape designer for over thirty years in the Bay Area while pursuing a side career in fine art. Now her primary focus, her artwork is ever evolving and as she finds more time, she focuses on combining her passion for travel with her passion to create. Packing her art supplies, her recent artistic wanderings have taken her to Costa Rica, France, New Mexico, Arizona and Hawaii and her artistic mediums have expanded into ink, watercolor and block printing. Feeling the need to express on a creative level is a driving force and a big part of what defines her life and with that comes growth and opportunity to continue to live the life of an artist. Her deep passion for her surroundings, for the arts and for the community goes beyond the studio. 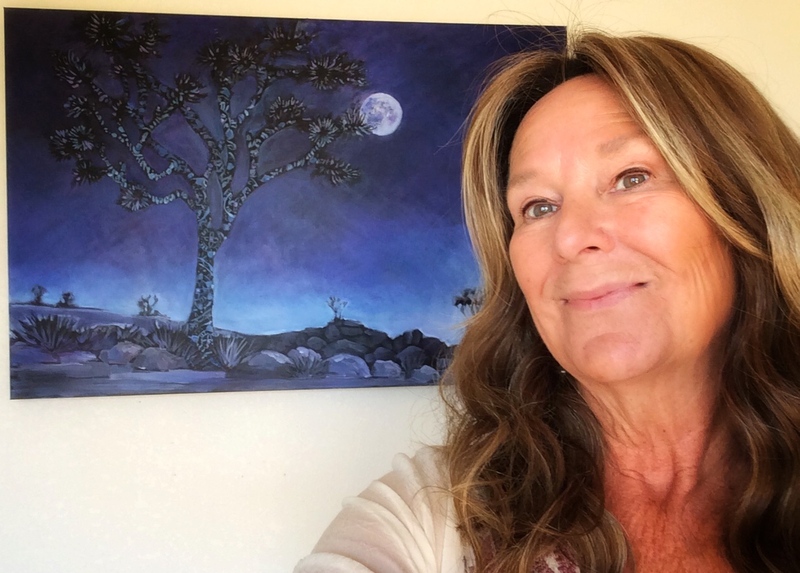 She was honored to serve as a juror on the 2016 Joshua Tree National Park juried Art Expo selection committee and was a guest artist for the Joshua Tree Art Innovation Laboratory series, sponsored by the National Park in 2016-17. She has served on the Board of Directors for the Morongo Basin Cultural Arts Council, managing exhibits, developing and heading up Gallery 62, the council’s cooperative gallery in Joshua Tree from 2013-14. She was director of the Hwy 62 Open Studio Art Tours from 2014 - 2015, the largest single art event in the county.